FAQ’s for Incoming RUHS Freshmen and New Students! - What is a block schedule? The block schedule consists of days A (Monday), B (Tuesday/Thursday) and C (Wednesday/Friday). Students attend all classes on Mondays, attend the even periods (2,4,6) on Tuesday/Thursdays and the odd periods (1,3,5) on Wednesday/Friday. Period 7 (if applicable) is attended per arrangement by teacher. - How long is the passing period? The passing period is ten minutes. - What time is zero period? Is it everyday? Zero period is everyday from 6:55am – 7:45am. - Where can a student be dropped off/picked up? The designated drop off/pick up point at RUHS are on Diamond and One Sea Hawk Way. - Can students eat snack/lunch off-campus? No, RUHS is a closed campus. Students are not allowed off-campus without an off-grounds pass or sticker. - How long is the snack and lunch period? Snack is 15 minutes long (9:50am – 10:05am), Lunch is 35 minutes long (12:20pm – 12:55pm). - Who can I contact if I have questions regarding a student’s academic progress in a specific class? Parents can contact the student’s teacher directly regarding the student’s progress in a class. If the parent still has concerns, they may contact their child’s counselor. - How do you sign-up for a locker? The majority of 9th graders will receive their locker assignments during registration; however, students not assigned a locker should see Mrs. Melgar in the Principal's Office, she will assign you a locker. - What is the dress code at RUHS? Appropriate clothing for young men and young women are required at RUHS, this includes: clothing that is safe and not disruptive to the school’s operation and students; clothing, jewelry, or other paraphernalia that denotes membership in gangs, advocates drug use, violence, discrimination, and/or disruptive behavior. - Am I able to use my cell phone, iPOD and other electronic devices at RUHS? Cell phones may be used before/after school and during snack/lunch periods. Cell phones must be kept in a backpack, purse or locker during class time and may not be seen or heard at any time during an instructional period. Students who fail to comply with this policy will have their personal electronic device confiscated by their teacher, campus security, counselor or administrator. Disciplinary action will be determined according to policy. - What is the Parent Portal? Is it only available to parents? The Parent Portal allows parents to access Infinite Campus, an on-line system where parents may view attendance, grades, schedule and school announcements. The Parent Portal also allows for student access; parents and students may create their own personal account. -What if I am locked out of the system? - Parents may contact the IT department at: ParentPortalSupport@rbusd.org for assistance. - How does my child pick their classes? The counselors will visit the middle schools and go over the course selection sheet with them. The students should take the sheet home and go over the information with their parents/guardians and obtain a parent signature. The students may then enter their requests on Infinite Campus. - How are teachers assigned to each student? Infinite Campus randomly selects each students’ schedule. - What adjustments can be made to my child's schedule once it's picked up at registration? Student may speak with their counselor regarding missing and/or incorrect courses on their schedule. Teacher change requests and/or change in period order will not be considered. Please have your child look closely at elective selection as electives changes will not be processed in the fall. - When is the last day to decide on a level change? Students may request a level change from registration day through the end of the sixth week of the first semester. Level changes will only be considered during the first two weeks of second semester. - When does my child pick up their class schedule? Students may pick up a copy of their unofficial schedule during Fall registration or make-up registration day; official schedules are handed out of the first day of school. - What zero period options are available for freshmen? Zero period options for freshmen include: ROTC and Marching Band; some upper level math and Spanish classes may also be available. Other classes TBD, most freshmen classes are not available during zero period. - Which classes are year-long? Which class are semester long? Most classes are year-long; some semester classes include: Health, Intro to Culinary Arts, Intro to Fashion Design, Communications Today, Contemporary Issues and Music Appreciation. - How much homework should I expect my child to have every night? The amount of homework per night varies depending on each students’ individual schedule; however, each 9th grader should expect approximately one hour of homework every night. - What tutoring resources are available? Please check with each teacher regarding their availability to assist students in groups or individually. Other resources include: the Redondo Beach library on-line tutoring service, on-campus tutoring clubs and the RUHS math tutor list. Tutoring resources are subject to change, please check with the teacher or your counselor for more information. - When do I pick up the class schedule? The unofficial class schedules may be picked up on registration day. The official schedule may be picked up on the first day of school. All classes are subject to change. - What if there is an error on my schedule? Please contact the counselor before school starts to make corrections to the schedule. - How do I clear an absence? Parents/guardians have five days to clear a student’s absence. The parent/guardian may clear an absence by calling the Attendance Office, writing a note (may be dropped off in the Attendance Office), or filling out the online absence form available on the RUHS website. Please verify that the absence has been cleared on Infinite Campus. - What are the penalties for being tardy? Excessive tardies may negatively effect a student’s citizenship grade. Three tardies is equivalent to one period truancy. - What do I do if I have a medical appointment during school hours? -How do I get my absence cleared? Parents/guardians must contact the Attendance Office in order for the student to obtain an off-grounds pass. Please allow ample time for the off-grounds pass to be processed. The student may pick up the pass before school, snack/lunch, or during a passing period. - How do I get an off-grounds sticker? Students who have an open period (i.e. students who have a zero period or seniors with five classes) may apply for an off-grounds sticker. An off-grounds application must be picked up from the Attendance Office at the beginning of each semester. Bring the completed forms and student I.D. to the Attendance Office to obtain the off-grounds sticker. Students will be allowed off-campus with a copy of their schedule for the first two weeks of class; students must subsequently have an off-grounds sticker after the first two weeks of the semester. - How do I request homework when my child is sick? If the student absent, please contact a classmate or the student’s teachers to request homework; you may also check your assignments on your teacher's RUHS website. - How do I know if I am eligible to play a sport? All students must maintain a 2.0 GPA on a quarter or semester grade report, earn no more than one “U’ in citizenship on a quarter or semester grade report, complete an athletic packet and be an Associated Student Body (ASB) member. - When do the sport summer programs begin? Summer sports programs will begin soon after the end of the school year, the actual start dates vary per program. - Can I participate in more than one summer program? Most students participate in one summer program; however, students may participate in more than one program, as long as the schedules do not conflict and both coaches are aware of the situation. - Will my child still be able to join the team if they do not participate in the summer program? What is the process? Although it is helpful for students to participate in the summer sports program, they may still be eligible to join the team and will have to try-out for the team at the appropriate time. - Will I be guaranteed a spot on the team if I participate in the summer program? No, unfortunately participation in the summer program does not guarantee a place on the sports team, although it is helpful. - When do sports try-outs take place? Sports try-outs occur throughout the year, depending on the season. Please check the Weekly Bulletin and/or RUHS website for upcoming information. I made it on a sport’s team – when will it be placed on my schedule? Sports schedule changes will occur once the official rosters are given to the counselors. - How many years of PE do I need to graduate from RUHS? All students must complete two years of PE to satisfy the graduation requirement. -Do I have other options other than 9th grade PE? 9th graders may also take ROTC, Marching Band, or participate in a sport to earn PE credit. Those who do not take ROTC or a sport must take 9th grade PE. - Do I need PE clothes? Students enrolled in PE must purchase a set of PE clothes. Contact the coach regarding other uniform requirements. - Where can I buy a set of PE clothes? PE clothes may be purchased at the ASB Finance Office or in the gym during registration or from their PE teacher when school starts. - What is the cost for PE clothes? A set of PE clothes costs $17. - What if I do not pass the California Fitness Test? All 9th graders must pass the California Fitness Fitness. Students who do not pass the test must take PE each semester until all tests are passed or until a student graduates from high school. - What are some clubs at RUHS? RUHS has over 80 clubs on-campus from service to special interests. - How do I register for a club? Sign-up for a club on club sign-up day or check the Weekly Bulletin to see when/where a club meets. - What is AVID? AVID (Advancement via Individual Determination )is a program designed to help students prepare for and succeed in colleges and universities. Students in the program commit themselves to improvement and preparation for college. The AVID program teaches the student how to study, read for content, take notes, and manage time. Students participate in collaborative study groups or tutorials led by tutors who use skillful questioning to bring students to a higher level of understanding. - What is ROTC? The Redondo Union High School Marine Corps Junior Reserve Officers' Training Corps strives to explore and develop in each student a variety of experiences that can be valuable not only in a few basic military skills but in everyday pursuits as well. The study of leadership traits and techniques is stressed but, more important, each student is provided an opportunity to apply and practice their own, leadership skills in many different situations. From the development of leadership skills and the discipline of self-conduct, the student is better prepared to face the challenges and obligations of citizenship. - What is AHF? The Academy of Health and Fitness is a small learning community that focuses on career paths in Health and Fitness. for juniors and seniors. - What is Link Crew? Link Crew is a leadership program that pairs upperclassmen with incoming ninth graders. The upperclassmen serve as mentors for the ninth graders and assist them with becoming familiar with the high school requirements and help facilitate a smooth transition to high school. - What does my counselor do? School counselors assist students with academic planning, career/college preparation and help students with personal/social issues. They support the students, teachers and parents of RUHS. - Who is my counselor? Students are assigned to counselors according to their last name. - How do I see my counselor? You may make an appointment to see your counselor by seeing the counseling administrative assistant before/after school and during snack/lunch periods. - Can I contact my counselor during the summer? Counselors will not be available over the summer. Please see your counselor during fall registration. -How do I join ASB? If you are interested in joining ASB, look out for announcements for upcoming elections and other ASB openings. -What does the ASB sticker do? The ASB sticker gives you discounts to sporting events, dances and other school activities. -What other activities do they have at RUHS? RUHS has numerous other activities such as school plays, musicals, various sporting events, dance competitions and concerts, sports tournaments (such as basketball, dodgeball, ping-pong, etc), music concerts, exchange student visits, robotics competitions, art exhibits…and much more! -What kind of information is available in the College/Career Center? The College/Career Center has information regarding college admissions, college testing, career research, scholarship information, volunteer information, financial aid information and more! -When can I visit? 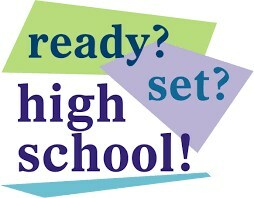 You may visit the College/Career Center before/after school and during snack/lunch. The College/Career Center hours are 7:30am – 4:00pm. Middle School Scheduling: Counselors visit the middle schools to discuss the high school basics and scheduling for next year. The students will receive an information packet and course selection sheet to take home, discuss with their parent/guardian and register for the proposed courses on-line. Freshmen Orientation: Freshmen students take a tour of the school and attend a Link Crew presentation activity. Freshmen Registration: Students submit their paperwork, pick up an unofficial schedule and books. What does A through G mean? In the upcoming years, it may be a common occurrence to hear the term “A through G requirements”. This term is used to reference a list of class requirements to be taken in high school in order to apply to a 4-year university. Each letter of A-G stands for an academic subject category (A= History/Social Science, B= English, C= Mathematics, D= Lab Sciences, E= Foreign Language, F= Visual and Performing Arts, G= College Prep Electives). Why do parents and students need to know this? The more information and direction you have about reaching future academic goals, the better prepared you and your student will be. Although your Parras student is currently in middle school, we’d like to present parents with important information about academic planning necessary in the near future for high school enrollment for those who are interested in attending a 4-year university. If your student is not planning on attending a 4-year university straight out of high school, these requirements are still important to understand as students may meet admission requirements through a city college campus and still have the opportunity to transfer to a 4-year university after requirements have been met. For those attending a city college straight out of high school, you will need to take a placement exam. The higher you score on your placement exam, the fewer classes needed to prepare for a transfer to a university. Therefore, A-G classes taken in high school prepare you for your transfer plan if attending a city college after high school. In summary, it’s a good idea to try and get as many A-G requirements done in high school to keep options open and to lessen your load if attending a community college. Where can I view a list of A-G courses? 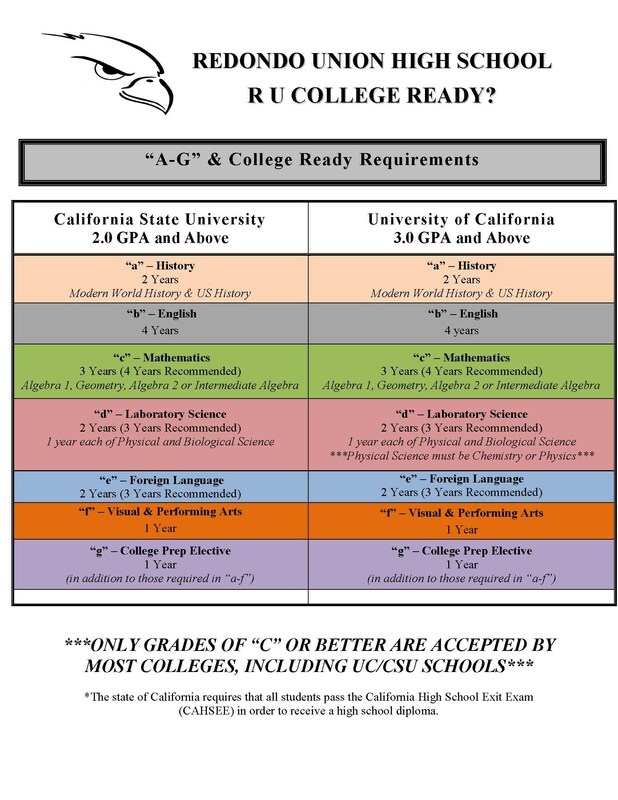 You can view the requirements in the chart below and you can go to the RUHS website, www.redondounion.orgto find the school’s course catalog under their “Academics” title at the top of their home page. The course catalog will describe each course available and specify if the course meets a UC or Cal State A-G requirement. Please note that courses offered at RUHS may change each year. Therefore, this message should be viewed to create a guideline rather than a concrete plan for your student. Additional links on the RUHS webpage are the “Counseling” link on the left side of the home page and the “Career Center” link, also located on the left side of the RUHS homepage. Particularly for current 8th grade Parras students and parents, be aware that RUHS counselors will be visiting 8th grade students at Parras on April 30th. On this day, RUHS counselors will be having your students enroll in several of their courses, most specifically, their electives. Please help your 8th grader prepare by reviewing the A-G concept with them and by helping them prepare any questions to ask of the RUHS counselors during their meeting on April 30th. We suggest parents and students take some time becoming familiar with the RUHS webpage as there is a lot of helpful information posted, especially on the Counseling and The Nest link. "RU READY CLASS OF 2023"